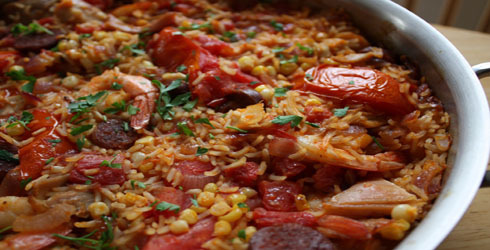 If you have children, even picky eaters, chicken paella is a great way to sneak in veggies and introduce some spices. The ingredients are pretty simple and should be easy to find for most. Chorizo is commonly carried in grocery stores, however, if you have a problem finding it you can substitute with another spicy sausage, such as andouille. Chicken Paella is a great family meal, you can switch up what types of veggies you include and chop them up to hide them from even the most persnickety eater. Summary: This Spanish dish is full of flavor, and made easy by using a rotisserie chicken. In a deep skillet over medium heat, heat the oil. Add the chorizo and sauté for 4 minutes. Add the onion and sauté until softened, about 2 minutes. Add the garlic and sauté for 1 minute more. Stir in the paprika, oregano, diced tomatoes, and water. Bring to a boil. Stir in yellow rice mix, simmer for 1 minute, and then cover. Reduce heat to medium-low and cook for 20 minutes. About 10 minutes in to cooking the rice, add the broccoli. Stir occasionally, and add additional water if needed. After the 20 minutes, place the cooked rotisserie chicken on top of the rice. Sprinkle the frozen peas over top, cover, and cook 5 minutes more. Chorizo is usually pretty easy to find in local grocery stores now. However, if you do have an issue finding it, you can use Andouille sausage or another spicy sausage. You can add in different veggies if you like. This is a great way to sneak them into your kids diet.